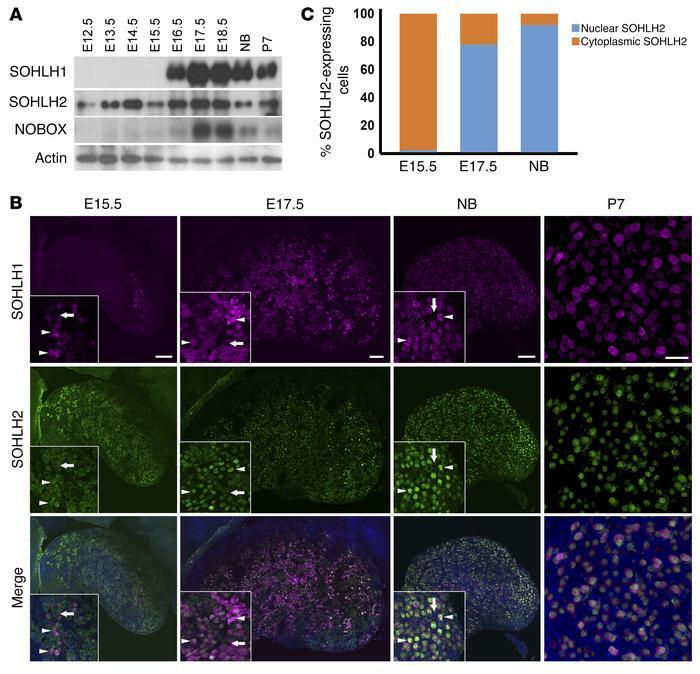 Expression of SOHLH2 and SOHLH1 during embryonic development. (A) Western blot analysis of protein extracts from embryonic (E12.5–E18.5), newborn (NB), and P7 ovaries. Affinity-purified polyclonal antibodies were used to detect SOHLH1, SOHLH2, NOBOX, and actin expression (n = 3 per group). (B) Whole-mount immunofluorescence staining with SOHLH1 (magenta) and SOHLH2 (green) in ovaries at E15.5, E17.5, the newborn (NB) stage, and P7. White arrows indicate oocytes that lack SOHLH1 expression and show SOHLH2 localization to the cytoplasm, while white arrowheads indicate oocytes expressing both SOHLH1 and SOHLH2 (n = 3 per group). Scale bars: 100 μm. Original magnification: ×40. (C) Quantitation of SOHLH2-expressing cells showing nuclear or cytoplasmic localization (n = 3 per group). Data are representative of at least 3 independent experiments.